As a leading supplier of pallet rack, Ace Industrial is always in the market to buy good quality pallet rack from warehouses. If you have any surplus pallet rack, cantilever rack, pallet shelving, heavy-duty shelving, or other material handling equipment, please call Ace Industrial at (800) 300-6034. We will gladly consider buying the equipment in your warehouse. We have plenty of customers who are looking for used pallet rack in good condition. Whether you’re relocating, downsizing, upgrading, or liquidating your assets, Ace Industrial can take that warehouse equipment off your hands. 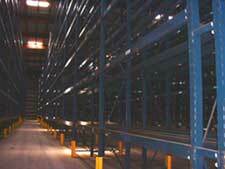 We have a lot of experience purchasing both new and used pallet rack from around the country. Remember, Ace Industrial is your best connection for pallet rack buy back.